Roasting mellows the sometimes sharp flavor of turnips and concentrates their texture into a tender, melting vegetable. Serve these easy roasted turnips with other roasted vegetables, alongside roasted meats, or with a simple roasted chicken. This recipe is really a method. Feel free to change the amount to suit your needs. Try adding herbs (rosemary is particularly yummy with the spicy bite of turnips) or spices, or combine the turnips with other root vegetables as you like. You'll find some tasty variations at the end of the recipe. Preheat an oven to 400 F.
While the oven heats, trim and peel the turnips. Tender baby turnips can be simply scrubbed instead of peeled, but even their peel will be a bit more fibrous than the tender insides. Leave baby turnips whole; cut larger turnips into large-ish bite-size pieces. Put the prepared turnips in a baking pan or on a baking sheet. Drizzle them with the olive oil. Use your hands or two large spoons to toss the turnips around a bit to coat them thoroughly with the oil. Sprinkle them with salt. Roast the turnips until they're tender and browned; start checking on them after about 30 minutes. Depending on the size and age of the turnips, it may take them up to an hour or more to get completely tender. 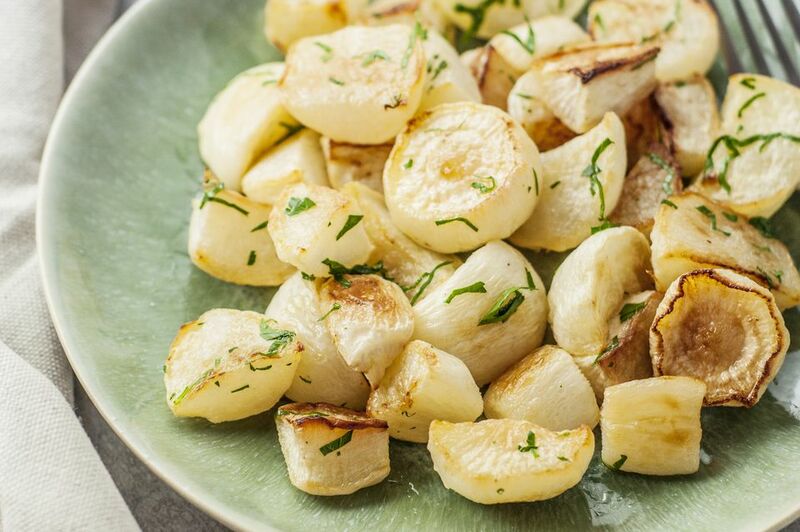 Serve roasted turnips hot, warm, or at room temperature as a side dish or as part of a roasted vegetable platter. They're tasty all on their own but can certainly benefit from a bit of extra love. After 20 minutes, add a few grinds of coarsely ground black pepper over the turnips. When you take them out of the oven, toss the turnips with a tablespoon or two of minced herbs such as parsley, thyme, and/or rosemary. Drizzle the roasted turnips with romesco sauce or homemade pesto when you serve them. If it's spring and you have baby turnips, they are a particularly good match for green garlic pesto. When the turnips are almost done, add about 1 tablespoon of butter, toss to melt the butter and coat the turnips, then sprinkle them with about 1/2 teaspoon garam masala (a mix of warm spices common in Indian cuisine), and toss again to coat them evenly. Roast a final 5 to 10 minutes. If you're cooking a chicken or a pork roast, simply add the turnips to the pan with it to roast alongside – the juices from the roast will flavor the turnips beautifully. Mix things up by roasting other root vegetables – potatoes, parsnips, and rutabagas are all goods choices. The mix will roast up best is you take the time to cut the vegetables into similarly sized pieces. Note: Beets are tasty but know that they will stain the turnips pink when they touch.